Please don't mind Sussanne, but our personal favourite is the one which Hrithik shared - the guys in aprons look so sharp! It was a 'well spent' Sunday for Hrithik Roshan and his ex-wife Sussanne Khan, with their children Hrehaan, 11, and Hridhaan, 9, in tow. The quartet dropped by an interactive food joint in Mumbai for a crash course in International cuisines and shared glimpses of their kitchen diaries on Instagram. 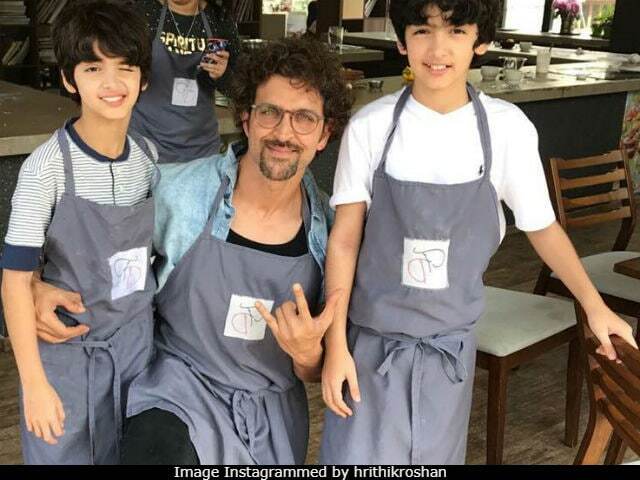 In separate Instagram posts, Hrithik and Sussanne featured with the two boys, who were in the midst of their kitchen training. Please don't mind Sussanne, but our personal favourite is the one which Hrithik shared - the guys in aprons look so sharp! Hrithik also let us sneak a taste of the menu like this: "Garlic chicken pesto, molten chocolate and calzones. Hopefully three things they'll never pester me to get again since now they know how to make it". "#Sundaywellspent," Hrithik added in tags. It was a different concern for Sussanne, who made mental notes, saying: "Note to self...#1 must cook more often it's too much fun! . #2 must make our boys learn to cook, it will make some girl very happy one day @gayatrioberoi thank u for this session. @flavour_diaries definitely a must do (sic)." Hrithik, Sussanne and the kids were at Flavour Diaries in Khar. Hrithik Roshan and Sussanne Khan divorced in 2014, after which they continue to be spotted together at parties, movie dates, get-togethers and the screenings of Hrithik's films. In September, Sussanne occupied quite a permanent spot on the trends list after one of her posts were seen as a response to Kangana Ranaut's many allegations against Hrithik. The 43-year-old actor and designer Susanne also often feature in headlines for reports of a probable reconciliation between the two. Earlier this year, Hrithik and Sussanne were mov with Hrehaan and Hridhaan. Hrithik Roshan was last seen in Kaabil, co-starring Yami Gautam. He is reportedly working on the script of Krrish 4 with his father Rakesh Roshan.